Despite Facebook’s dominance of the social media landscape over the past decade, the platform is still growing steadily, and it still manages to tell a compelling story ever quarter. 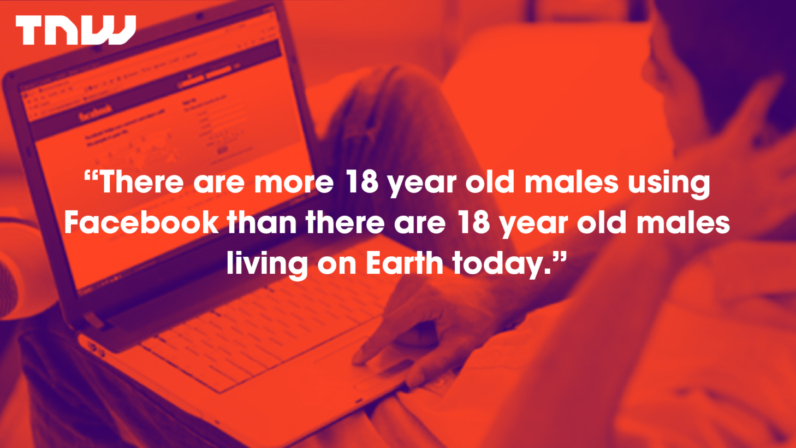 However, there’s often more to these numbers than meets the eye; for example, there are more 18 year old men using Facebook today than there are 18 year old men living on Earth. Let’s look at how that’s even possible. When we look at Facebook’s high-level numbers, there are already plenty of juicy stats; two-thirds of its total global audience uses the platform every day, and 94% of active users access the platform via a mobile device. It’s not just the big numbers that tell the interesting stories, though. I’ve been analyzing Facebook’s global user demographics over the past few weeks, and my analysis reveals some surprising numbers about users’ gender and age that have critical implications for businesses who use Facebook for marketing and community engagement. The first finding isn’t ‘new news’, but it’s still important: Facebook still appears to suffer from a gender bias, with 56% of the platform’s global account profiles set to ‘male’ (we’ll come back to why I’m saying “set to” in a moment). From a relative comparison perspective – i.e. 56% male vs. 44% female – that means that ‘males’ account for 27% more active accounts than ‘females’. When we start to analyse Facebook’s active users by age, though, things get even more interesting. The key take-away appears to be that young people still make up the largest share of Facebook’s global active user-base, despite ongoing media speculation to the contrary. Indeed, based on the information that active users have entered into their profiles, 18-year-olds make up the single largest age group of active users on Facebook today. However, analyzing the platform’s users by individual year bands reveals some intriguing insights. Age: More Than Just A Number? Spikes in user numbers then occur consistently at each age ending in a ‘6’ – i.e. 26, 36, 46, and 56. Older people under-stating their age to a ‘golden number’, in order to appear younger than they really are, potentially for reasons of vanity. However, the third set of spikes has a more interesting explanation. At first glance, ages ending in a ‘6’ don’t appear to represent anything meaningful, but if you consider the correlating year of birth, it’s easier to draw some hypotheses. People may still be wary of sharing too much personal information online, so they’ve ‘rounded’ their birth year to a convenient decade (or half decade) to avoid entering the correct data (possibly because they’re scared this data will be hacked and used for identity theft). Some of these accounts may be ‘fake’ profiles, created for ‘click farm’ purposes by unscrupulous third parties. Ages ending in 0s or 5s would fit neatly into the age brackets commonly used by marketers for ad targeting, which would make these profiles more attractive and valuable. I decided to dig a bit deeper into these phenomena, and my findings reveal some critical implications for marketers who rely on demographic targeting to plan their digital advertising. I compared Facebook’s user data by age and gender to the corresponding data for global populations at each age (using data from the UN and the US Census Bureau), and removed the respective populations for China for improved accuracy (Facebook is still blocked in China, although the platform reports 2 million active users there). It’s clear from the male chart that the numbers don’t add up; specifically, 110% of the eligible male audience aged 18 is using the platform today. In simple terms, that means there are more 18 year old males using Facebook than there are 18 year old males living on Earth today. That means that at least 1 in 11 of Facebook’s 57 million profiles claiming to be men aged 18 must contain at least some false information. It’s not just the profiles of 18-year-old males that don’t add up either; a similar issue appears in the profiles of women who claim to be 18 years old, as well as for the profiles of men and women who claim to be 21. The same is true of men and women who claim to have been born in 1990. The 1 in 11 finding above is just the minimum error, though. The latest data from GlobalWebIndex indicate that 92% of male internet users aged 18 around the world – and 93% of female internet users aged 18 – use Facebook each month; that’s obviously much lower than the data above suggest. What’s more, if we were to extrapolate GWI’s data out to include 18 year olds who don’t use the internet too, it’s likely that we’d find that roughly 1 in 5 of all Facebook profiles where the age has been set to 18 actually belong to someone of a different age (if they belong to a real person at all). It’s critically important to note that these anomalies are unlikely to be caused by a glitch in Facebook’s system. It’s also unlikely that they are the result of Facebook itself misrepresenting any data. Instead, it’s likely to be the users themselves who are misrepresenting their age when completing their Facebook profiles, whether for their own vanity, or for more fraudulent reasons. But is this behaviour limited to misrepresenting age? Let’s go back to my awkward choice of wording above, where I talked about users ‘setting their gender’ to male. Based on some preliminary conversations to investigate these odd age-related phenomena, I suspect that it’s also probable that Facebook’s global bias towards male profiles may be in part caused by similar user misrepresentation of gender, especially in societies where women are afforded less freedom of speech or behaviour compared to male peers. It’s likely that relationship status, location, and various other ‘facts’ are prone to the same kind of misrepresentation too. As a result, many of the things that people claim in their Facebook profile may not be true. That’s probably not a surprise to most of you reading this; people often present selected truths and “alternative facts” about themselves in offline interactions too. However, this behaviour makes it much more difficult for marketers to know how they should approach targeting on platforms like Facebook. On the one hand, if a brand targets users aged 18-24 on Facebook today, there’s a good chance that many of their ads will be shown to people who aren’t really in that age group (even though those people claimed to be that age in their Facebook profile). On the other hand, we could argue that targeting people’s ‘desired age’ could be more valuable. An example of this would be Harley Davidson, where the brand’s buyers actively identify with the ‘youthful spirit’ that the brand portrays, even though, in reality, they’re in their 40s or 50s. Digital targeting was supposed to help us remove guesswork, though, so – even if there may be some fortunate side-effects to age misrepresentation – it would be better for marketers to know exactly who they’re targeting in advance, and to replace that element of chance in favour of active targeting. My research suggests that a significant number of users have entered inaccurate demographic information about themselves (age, gender, location, etc.) in their Facebook profiles. As a result, brands relying solely on demographic targeting will be reaching many people who claim to be a certain age, but who, in reality, are not in the brand’s desired audience at all. This will likely result in less effective campaigns, and reduced returns on investment. It’s important to stress that this issue is specific to demographic targeting though. Facebook still offers one of the most effective and efficient ways of reaching nearly 2 billion people around the world, but in order to make best use of this opportunity, my counsel to marketers is to significantly reduce dependence on demographics, and to adopt alternative methods of identifying and targeting relevant audiences. Ideally, marketers should engage audiences based on people’s actual behaviour, or at least based on their declared interests (e.g. the pages they have ‘liked’ on Facebook). These approaches are less likely to suffer from the distortions we’ve detailed above, and critically, they’re likely to drive more targeted and relevant engagement too. Lastly, it’s worth stressing that this problem won’t be restricted to Facebook; my hypothesis is that these challenges will replicate across other digital platforms offering similar kinds of demographic targeting based on user-declared information too.